PROPELLING MACHINERY of the vast cargo liner City of Barcelona (5,787 tons gross), belonging to Ellerman Lines, Ltd. 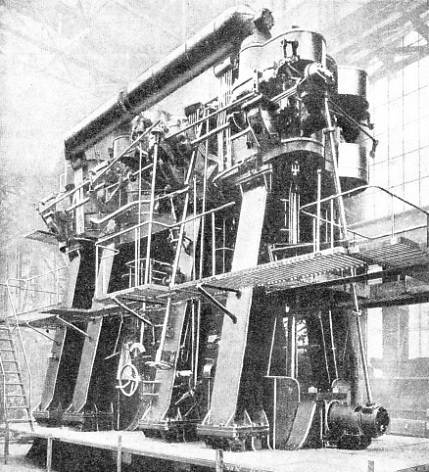 This vessel has a four-cylinder triple-expansion engine fitted with Caprotti patent poppet valve gear. In a big ship the ex-apprentice serves as junior engineer and works under the guidance of a certificated man. The certificated engineer in charge of the watch is responsible for the instant obedience of all orders coming through the bridge telegraph. OF the many branches in which the youngster to-day can follow the sea as a profession there are few which are more promising than the marine engineering branch. It appears to have a particular hold on the Scottish imagination, and the Clyde may reasonably claim to be the real home of marine engineering. Although the job of a marine engineer is a good one, the path to it demands the patience which is the traditional attribute of the Scot. It is not a job in which the youngster can go straight from school into the heart of things. Before he can even be considered as a ship’s engineer he has to serve his apprenticeship, the accepted period being five years, in some engineering shop ashore. The shops or works in which the apprentice serves his time need not necessarily be devoted to marine engineering. The strict regulation of the Board of Trade is that he must have spent three years in the making or repairing of marine engines. This regulation, however, is interpreted generously, and special circumstances are always taken into full consideration, provided that they do not defeat the official purpose of securing the highest professional skill and the greatest possible safety for the ships. A number of budding marine engineers, therefore, begin their apprenticeship in a general engineering works, and many start in the locomotive branch. During his time the apprentice is given the opportunity of seeing as much as he possibly can of the work of an engineering shop. A great part of his time will be spent helping craftsmen of every description and learning as much as he can by watching how they do their work and listening to what they have to say. After a spell of watching other people, and having been given every opportunity to learn, the apprentice will probably be put in charge of some machine himself - a turning lathe, shaping machine, or something similar. He will often be a member of a gang employed in erecting. The aim of his apprenticeship is to give him experience in every department. After the apprentice has completed his third year he will probably be given a good deal of responsible work, for it is generally understood that the last two years of his time are to give his employer a return for the training that he has afforded. By that time the lad ought to be equal to the journeyman. A particularly clever and industrious apprentice will probably spend the last year of his time in the drawing office of the firm. This offers the greatest chance to learn things that are useful for subsequent advancement; but the ordinary apprentice spends only a short time there, just enough to let him understand the work of this department. When he has completed his time and made up his mind to go to sea, the youngster’s next job is to find a shipowner who will take him. At the present time, when there is a shortage of good marine engineers, there is little difficulty about that, and he has the opportunity of making his choice. For comfort, a big ship is the best, but the ambitious youngster who wants to get his Board of Trade certificate as soon as possible chooses a small ship, for in her he may well be in charge of a watch as fourth engineer; and he cannot sit for his second-class Board of Trade certificate unless he has been at least eighteen months in charge of a watch. A FIREMAN IN A CARGO SHIP. The old type of coal firing is passing in the big liners with the adoption of oil fuel or mechanical coal stoking, but it survives in many cargo steamers. The work requires considerable skill and is particularly arduous in hot climates. The fireman has to know the exact spot in the furnace where the shovelful of coal should be thrown and the exact amount required. He must keep the boiler furnace fires properly levelled and the fire bars clear of clinkers and other useless products of combustion. In a big ship the ex-apprentice goes as junior engineer and does everything under the guidance of a certificated man. It may be ten years before he has the chance of taking charge of a watch, but during that time he will have learned almost everything that there is to learn. In a big liner there are probably three or four uncertificated junior engineers in each watch. There are any number of pumps to be watched to make sure that they are functioning perfectly and that there is no fault. The junior engineers are expected also to keep a careful eye on the main bearings in the shaft tunnel to obviate any chance of overheating. They supervise the greasers and firemen at their work and generally look out for trouble in every part of the huge machines. They have to take particular care of the auxiliary machinery, including the generators and steering gear, and in the stokehold of an oil-fired ship they have to keep a careful eye on the burners and on the exact mixture of oil and air, as well as on the temperatures. Should there be any accident at sea, or anything in need of overhaul, the junior engineers will act as fitters and put to good use the practical knowledge that they gained in the shops. The first Board of Trade examination which the young engineer has to pass is that for the second-class certificate of competency, for which he cannot sit until he has been eighteen months in charge at sea under a senior engineer. For a good deal of this time he will probably have been in sole charge of the stokehold, or some similar section, so that, although he will seldom have the responsibility of a watch, he will have had a good deal on his shoulders and be prepared to undertake more. He must take to the Board of Trade a certificate signed by the Chief Engineer. This will satisfy the examiners as to his ability on the practical side, for the examination itself is entirely theoretical. It is an exceedingly searching one, covering mathematics, a series of written questions and a viva voce examination by a Board of Trade surveyor. certificated engineer in charge of the watch has to remain within easy reach of the starting platform all the time he is on duty, the instant and correct obedience of all orders coming through the bridge telegraph being entirely his responsibility. In big ships the senior second engineer does not keep a watch, but the junior second takes the watch from four o’clock to eight o’clock in the morning and afternoon, the senior third engineer the twelve to four watch, and the junior third engineer the eight to twelve watch. To sit for his chief engineer’s ticket the applicant must have been in charge of a watch with a second-class ticket for at least a year, must produce the usual references of practical ability and must be prepared for a strict examination on the same lines as that for the second-class certificate. The most a mbitious marine engineers will sit for their extra chief engineer’s certificate, which is exceedingly scientific and which proclaims the holder to be a first-class man in every way. It is not necessary at sea, for the holder of an ordinary chief’s certificate is qualified to take charge of the machinery of the biggest ships afloat, but the extra certificate is fully appreciated and its holder is treated with the proper respect for knowledge. The chief engineer of a ship does not keep a watch but is always in the engine-room when the ship is entering or leaving port and exercises a general supervision of everything that goes on in his department. He has to keep the various logs which are demanded, is responsible for the stores ordered and for the maintenance of the fuel supply. The discipline of the engine-room is also in his hands, although he has no power to punish. The ordinary second-class or chief engineers’ certificates are for either steam or diesel, according to the examination taken and the experience of the applicant. A steam certificate can receive official endorsement for diesel work after the holder has had a certain period of practical experience in a motorship, but to get his certificate endorsed for steam the diesel man has to go through the examination in steam. In addition to these ranks of junior and certificated engineers, there are plenty of other subordinate jobs connected with the machinery of a modern ship, most of which are apt to be something of a blind alley. For instance, the electricians on board are not certificated men, but they must have served their apprenticeship and have obtained practical experience on land. Each is under the engineer in charge of the watch and has all the detail work connected with the electrical side - wires, fuses, lighting, fans and the like. This electrical side can be exceedingly complicated on board a modern passenger liner and the electricians have to be fully qualified, but they can never rise above the rank of senior electrician. Another uncertificated rank is that of the refrigerating engineer, popularly known as the freezer. A big ship carrying fruit, or chilled and frozen meat whose value may run into £1,000,000 sterling, carries several refrigerating engineers who are under the engineer in charge of the watch but responsible to the chief engineer. They have nothing whatever to do with the propelling or the auxiliary machinery, but they are fully occupied with their own work. The boilermaker, who is usually the only man of his rating in the ship, is generally on day work only, except in emergency. His sole duty is in connexion with the boilers, with which he has been associated since his apprenticeship. He has to see to their cleanliness, upkeep and maintenance, doing all necessary repairs that are within the limits of shipboard work and do not demand the attention of a dockyard. The donkey-man is a leading fireman who attends to the auxiliary (donkey) boiler in port and acts as a fireman at sea. The winchmen are highly skilled men, but there is no necessity for them to have served an apprenticeship. Most big ships carry two winchmen. One of these is on deck, in charge of the winches, windlass and steering gear, but he is concerned only with their maintenance and does not work them at all. The other is the galley winchman who looks after the maintenance of the complicated cooking plant in the galleys, the steam boilers, stoves, and the like. Big ships will carry two plumbers who have already had experience ashore and who are responsible for the elaborate piping of a modern ship, the hot and cold water, the sanitary services, and so on. Finally there come the firemen, trimmers and greasers. In connexion with the firemen there has been the greatest possible change since the general adoption of oil fuel instead of coal under the boilers of steamers. Only about one-third of the number are employed with oil fuel but these have to be highly skilled and are not the rough type which popular imagination invariably, but often unjustly, connects with the job. They have to pay particular attention to keeping the oil burners clean, neglect of which will soon cause trouble. They are also called upon to assist in the engine-room when labourers’ services are necessary for various lifting jobs. The old type of coal fireman is passing in the big liners, but he will probably last for many years in the tramps. There are good firemen and bad, and lack of skill will make a surprising difference to the working results of a ship. The good man knows exactly how to make the best use of his muscles, so that he can get through a full watch of hard physical labour without lowering the standard of his work. The fireman must always keep the burning coal properly levelled. He uses his heavy slices to do this and to keep the fire bars clear of clinkers which would prevent the draught from passing between them. All coal fires have to be cleaned of their ash and clinker once in each watch. 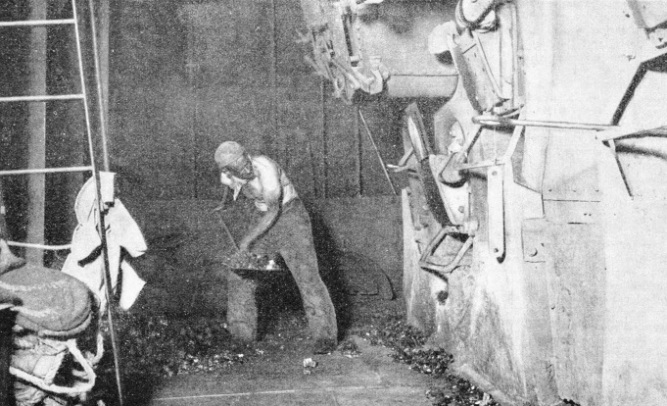 Coal-burning steamers also carry trimmers, whose, job is even harder, physically, than that of the firemen. When the ship is taking in coal the trimmers have to be in the bunkers trimming it down so that it fills all the pockets. At sea they have to spend part of their time in the bunkers, making sure that the coal will run down to the doors smoothly and evenly, and part of their time in the stokeholds with wheelbarrows taking the coal from the bunker doors to the plating beside the firemen. The hardness of this work may be imagined, especially in a ship which is rolling and pitching in a heavy sea. The greaser is the labourer of the engine-room and, as his name suggests, he is primarily responsible for the lubrication of the moving machinery under the supervision of the engineers. The job of marine engineer is not one to be undertaken by the lad who wants an easy time in life and a placid existence with the minimum of effort and work. To the youngster of keenness and ambition, however, it offers magnificent prospects now that shipping is reviving, and there is not the least doubt that these prospects will increase for several years to come. There is a serious shortage of qualified marine engineers, partly because so many have found permanent jobs ashore, and partly because of the severe slump in shipbuilding which caused many big yards to close down or to suspend their activities, thus causing a shortage of apprentices. 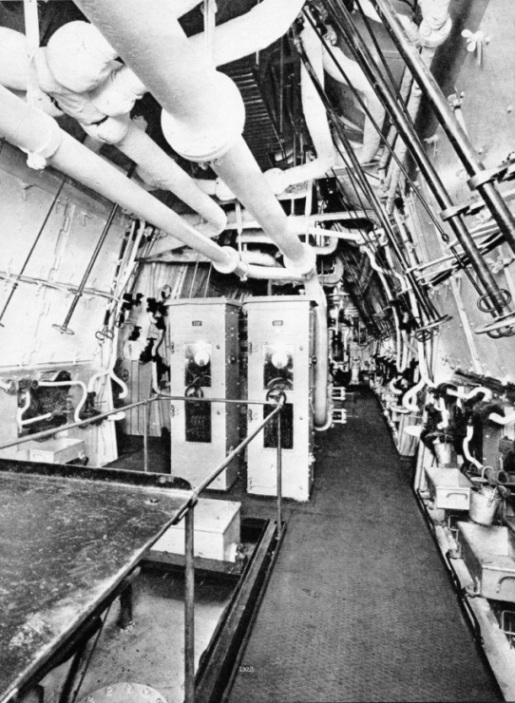 You can see a photograph of the forward engine-room of the “Empress of Britain” in the photogravure supplement.